Composite Repair -- Stanford U. Architectural design and construction work are increasingly affected by governmental health regulations. Failure to comply with regulations not only threatens the health and safety of employees and contaminates the environment, but can endanger a company’s financial well-being with costly accidents, fines, and lawsuits. How to identify, in the planning stage, systems that do not meet the standards. How to recognize, by sight, finished systems that are wrong for the proposed application. EPA exhaust and emission standards, types of air purifiers, sick building syndrome, mold and other biological hazards. How to identify true "Green Materials" by understanding the definitions of technical terms used on material safety data sheets (MSDS). How to evaluate air quality test data and measure air flow. How to analyze advertising claims for bogus air purification systems. The basic provisions of the Federal Occupational Safety and Health Administration’s Hazard Communication Standard and the New York State Right-to-Know Law. Protecting yourself on site: safety equipment and respiratory protection. The chemical and physical hazards of materials used in construction and building preservation. In September 2002, RESTORE presented a three-day Workshop on Mortars for Historic Structures: Characterization, Performance, Replication, the first in this series to be held at University of Pennsylvania. The workshop covered all aspects of this fundamental preservation maintenance procedure. Replacing deteriorated mortar is one of the most important periodic needs of masonry structures. Proper analysis and formulation of mortars is critical to an architectural conservation project. A pointing mortar must be chemically and physically compatible with the surrounding masonry materials and must be installed correctly. If not, the mortar will perform poorly and fail, adversely affecting the weathering resistance of a structure, and accelerating deterioration processes. When properly formulated and installed, pointing mortars will last for generations, making masonry one of the most durable construction materials. The response to this workshop from both the sponsors and the students was terrific. The written evaluations from the workshop participants – the barometer of our success – were extremely positive. Geographically, the workshop drew participants from around the nation. The fifty participants came from New York, New Jersey, Pennsylvania and the greater Philadelphia area , California, Washington State, Minnesota, Ohio, Louisiana and Puerto Rico. The participants profile included a cross-section of U Penn students, architects, architectural conservators, engineers, preservationists, contractors and craftworkers. 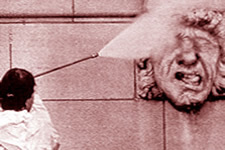 In May of 2002, RESTORE presented a Workshop on the Technology of Cleaning Masonry Structures, the third in a series of RESTORE Workshops on Architectural Conservation Techniques held in Seattle. The workshop covered all aspects of this challenging and complex process and gave participants an understanding of the methodology and technology of cleaning masonry structures. 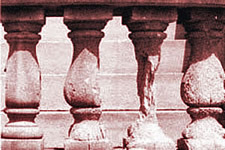 In the fall of 2001, RESTORE presented the Workshop on Mortar Matching and Repointing, the fourth in a series of workshops held at Stanford University. Repointing is of vital importance in the conservation of masonry structures. A mortar mixture must be similar to the existing mortar or stone in both its chemical and physical properties. Otherwise, the new mortar will adversely affect the aesthetic quality and weathering resistance of the structure. When properly installed, masonry repointing will last for generations, making masonry one of the most durable construction materials. When improperly installed, the mortar will perform poorly, look aesthetically unappealing, and, in some cases even accelerate structural damage. 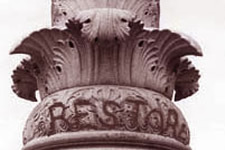 In the spring of 2001, RESTORE presented the Workshop on Formulating Composite Repair Materials for Masonry as part of the highly successful RESTORE Workshop Series on Architectural Conservation Techniques. This was the second workshop of the series to be held in Seattle. The Workshop attracted architects, engineers, craftworkers, preservation / conservation consultants, cultural resource managers and an archeologist from a number of states including, Texas, Montana, Louisiana, Arizona, Minnesota, Ohio, California, Oregon, British Columbia and of course the State of Washington. RESTORE presented the Workshop on Cleaning Masonry Structures, the third in a series of workshops held at Stanford University. The workshop was highly successful, with fifty participants representing a cross-section of architects, engineers, craftworkers, contractors, facilities managers and preservationists from all parts of the nation. The workshop covered all aspects of this challenging and complex process and gave participants an understanding of the methodology and technology of cleaning masonry structures. In March of 2000, Jan C. K. Anderson of RESTORE was invited to be a member of the Task Force to draft the Charter of Cairo and to participate in the Hassan Fathy Institute’s Conference on Sustainable Architecture. The conference focused on the severe lack of decent, affordable housing worldwide and was attended by design professionals, planners, public policy decision makers and trade union officials from around the world. The housing problem is particularly acute in developing nations where housing needs cannot always be met through use of modern construction materials and techniques, which are scarce, expensive and wasteful. The conference explored ways to promote the increased use of indigenous building materials such as mud brick, bamboo, wood and thatching. These materials have been used for centuries and are durable, attractive, inexpensive and environmentally friendly. A fundamental and integral element of sustainable architecture is the training of skilled craftworkers to design, build and maintain the housing in their local communities. To articulate this thesis, the conference participants will work to draft and adopt The Charter of Cairo, a manifesto that will serve as an international guideline for the development of sustainable communities worldwide. The second in the RESTORE Workshop Series at Stanford University focused on the conservation of architectural terra cotta. This workshop was held at the School of Earth Sciences and included a day-long field trip to the Gladding McBean terra cotta manufacturing facility. There were forty-five participants, representing the diversity of the field of building preservation. Approximately half of the attendees were preservation craftworkers, with architects, engineers, consultants, facilities managers and contractors making up the balance. 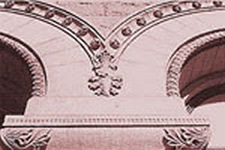 RESTORE introduced a Series of Workshops on Architectural Conservation Techniques in Chicago. The first Workshop of the Series addressed the preservation and maintenance of architectural terra cotta. The Workshop was a great success, with over seventy participants representing a cross-section of architects, engineers, craftworkers, contractors, facilities managers and preservationists. Geographically the Workshop drew participants from around the nation, from New York City to Seattle and San Francisco, with many from the Midwest. Everyone displayed a great deal of interest and enthusiasm for the issues that were covered, and many of the participants indicated that they wish to take part in the future workshops in this Workshop Series. The Workshop helped to instill a spirit of collaboration among the diverse segments of the preservation community that attended. This was the first in the RESTORE Workshop Series on Architectural Conservation Techniques presented at the School of Earth Sciences at Stanford University. Participants learned how to design mortar mixes and formulate composite repair compounds for stone that are physically and chemically compatible with the original materials. There were forty participants, representing the diversity of the field of building preservation. Approximately half of the attendees were preservation craftworkers, with architects, engineers, consultants, facilities managers and contractors making up the balance. Understanding the health risks posed by many restoration materials and process is essential to the safe and effective treatment of architectural conservation problems. This workshop focused on key preservation processes and materials and on their inherent hazards. The workshop presented practical solutions to critical preservation problems related to the hazards and environmental impact of the technology we specify and use today. This RESTORE Workshop was funded in part by the National Center for Preservation Technology and Training of the National Park Service, The International Masonry Institute, and the International Union of Bricklayers and Allied Craftworkers. Graduates of this RESTORE Workshop are eligible to receive 48 AIA Continuing Education Learning Units.